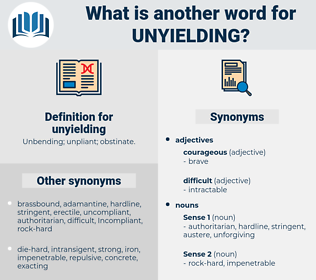 What is another word for unyielding? unswerving, unrelenting, unfailing, abiding, unbreakable, staunch, unbroken, stiff. Refusing, hardening, unrelenting, unfailing, abiding. unwavering, uncompromising, unshakeable, unflinching, unshakable, rigid, steadfast, single-minded, tough, adamant. Surrendering, giving, soft, kind, merciful, yielding, pliant, compassionate, cooperative, pliable, sympathetic, nice, submissive, flexible. accepting, malleable, obliging, permeable, light, spineless, receptive, reasonable, thin, plastic, wavering, temperate, slack, agreeable, complaisant, floppy, willing, irresolute, softening, slavish, persuadable, bendable, lank, responsive, complying, invertebrate, scattered, droopy, flaccid, semisoft, governable, subservient, airy, slackening, teachable, loose, porous, workable, undecided, limp, elastic, impotent, weak, gentle, dutiful, placable. I never had lacked faith in Roger, but never before had I appreciated to the full his reckless courage and his unyielding sense of personal honor. As the Yale boat crossed the line Frank lay, deaf to all the tumult of applause, his eyes closed, but still with his pale face set in a look of mingled pain and unyielding determination.